Confirmation is one of the sacraments of the Church whereby a baptized candidate makes a mature profession of faith in the presence of a Bishop. In Confirmation, the candidate chooses to claim for themselves the baptismal promises made on their behalf by parents and/or godparents at an earlier date. Confirmation is the commitment of one’s life to Jesus Christ. 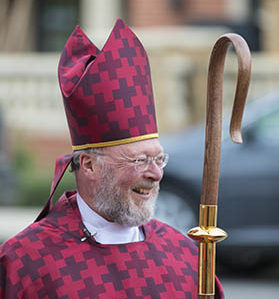 The Bishop then “confirms” the gift of the Holy Spirit through the laying-on-of-hands as a means of strengthening the candidate on their life’s journey. Reception is a ceremony celebrated by the bishop, in which someone who has been confirmed in another Catholic communion is received as a member of the Episcopal church. For information on Confirmation or Reception, please contact The Rev. Terri Hobart.